Get a Free EstimateSave money and control mould and moisture in your home with our crawl space products today! For a free crawl space insulation quote, contact us today! We serve Sarnia, London, Windsor, Chatham, Stratford, Windsor , Leamington, St Thomas, Amherstburg, Strathroy, Essex, Goderich, Ingersoll, Kingsville, Listowel, Hanover, Aylmer, and many nearby areas in Ontario. A vented crawl space will cost you a bundle in utility bills, while rot and mould will force you to make otherwise unnecessary repairs to your home. Sealing and insulating the crawl space using this puncture-resistant, padded product will help to keep your utilities (such as your furnace, heating ducts, hot water pipes, and water heater) from having to work in a cold, damp crawl space. It will also protect the wood and stored objects in your crawl space from water vapor and humidity, controlling mould. TerraBlock™ is just one part of our complete crawl space repair system. By combining it with our other products, including POLARFOAM 7300 spray foam insulation and CleanSpace® Vapor Barrier, you can keep your crawlspace dry and insulated. We can also waterproof your crawl space with products like our SmartSump™ Sump Pump, our SmartPipe™ Drainage System, and our durable CleanSpace® Drainage Matting--all of which are compatible with a TerraBlock™ installation. At Advanced Basement Systems our team of in-house crawl space experts has just what you need to encapsulate your crawl space and keep it a warm, dry, and clean-looking place--one you won't mind crawling into! 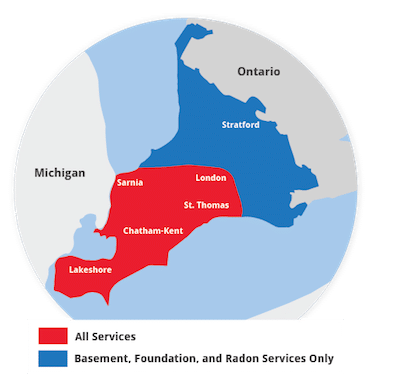 We proudly serve London, Windsor, Chatham, Sarnia, Stratford, Windsor , Leamington, St Thomas, Amherstburg, Strathroy, Essex, Goderich, Ingersoll, Kingsville, Listowel, Hanover, Aylmer and many other parts of Ontario.